Do you know where my son is? I saw him walk out of the house. you are indicating that you are in the house. I saw him come out of that house. you must be already out of the house. Here are the four basic choices and you can see their similarities to the same English. I came, then (kind of right away) he came out from the kitchen. He went out of the kitchen. Mom called me, (so) I came right in. She invited you to go in. I will go in soon. I will go in at once. I want to go out and play with the dog. The puppy came into the kitchen because it wanted to watch me making dinner. After the puppy chewed up my homework she had to go in the kennel. It heard the sound of the vacuum cleaner and came right out of the room. When our youngest played the piano, the puppy went right out from the kitchen to the living room (then) started singing. Possibly at this point you feel like you don’t know if you are coming or going. 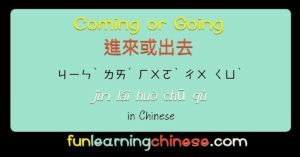 Here are a few ways you could express that in Chinese. My schedule is too full; I am so busy I don’t know whether I am coming or going! I have too much work! It is making my head spin! I have so much work that I am awfully busy! 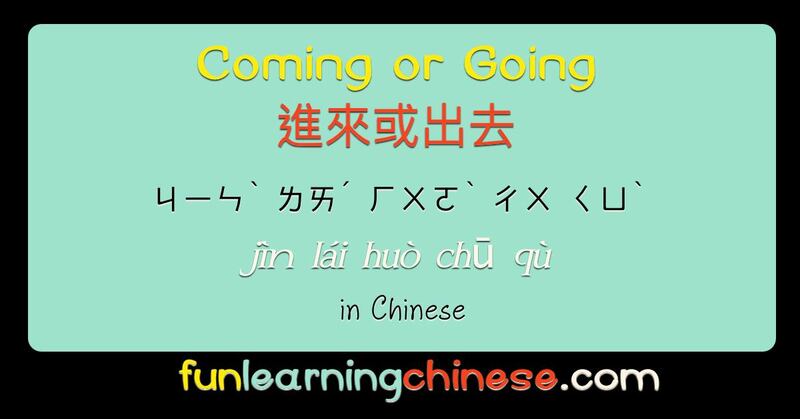 (a printable pdf of this lesson is available on my Fun Learning Chinese (FLC) private resource page, which you get access to when you sign up for my FLC newsletter, wherein I share fun things that I discover about learning Chinese. ❶ This is one of those words that seems unnecessary to the English ear, but my tutor says that without it the sentence sounds like it is missing something. English has “filler” words like that, too. ❷ Have I mentioned that I love this Chinese word? It literally means “get on the horse,” indicating that you will ride right off and get something done! ❹ The doubling of the verb makes the sentence a little more light hearted. in Chinese. I chose to use 狗籠 because in America we associate a dog house with something out in the yard and the dog is not usually shut up in it. Also, I thought the second character, 籠, was more interesting. The main part of the character is the same as the character for “dragon, ” 龍 🐲，AND is pronounced the same. The part on the top of the “cage” character is the radical for bamboo, since that is the ancient material for constructing cages. then the translation is: it wants to watch what I’m making for dinner.